I was first introduced to the famous consulting detective Sherlock Holmes, in The Adventure of the Three Garridebs, in my fifth-grade reading class. A few months earlier, I had just started collecting coins. Early in the story, an eccentric collector is polishing an ancient Greek coin when Holmes and Watson visit his home. Later, we discover a counterfeiter’s printing press in a secret basement of that collector’s home. I was intrigued by what I had read and mentioned this to my family. A few weeks later, I was given a collection of Sherlock Holmes stories by my grandfather for Christmas. I remember curling up in my bed, reading The Adventure of the Red-Headed League. This story involved an attempt to rob a bank that had recently deposited 30,000 French gold coins in its vaults. I was now hooked on the tales of Sherlock Holmes and Doctor Watson. Sir Arthur Conan Doyle authored 56 short stories and 4 novels featuring the detective and his companion over 40 years, from 1887 until 1927. 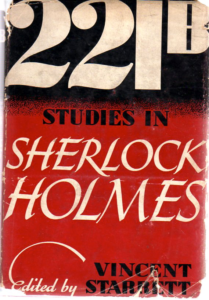 The publishing company of Doubleday & Doran issued a revised second edition of its Complete Sherlock Holmes after Doyle’s death in 1930. Doubleday asked a New York literary magazine columnist, Christopher Morley, to provide an introduction to the new edition. As Morley was growing up in Baltimore at the turn of the 20th century, he became a fan of Holmes and would head down to the central branch of the Enoch Pratt Free Library to read the stories shortly after they were published in Collier’s. After stints with Ladies’ Home Journal and the Philadelphia Evening Public Ledger, he began working for the New York Evening Post. While at the Post, Morley began a column, The Bowling Green, in the newspaper’s pullout Saturday Review of Literature and continued as a columnist when the SRL became a stand-alone publication in 1925. Still an aficionado of the Holmes stories, he occasionally included some Sherlockian items in his columns. Remember, at this time, there were still about a half-dozen Holmes stories not yet published! Morley was very much a social person and enjoyed forming “clubs” and inviting like-minded individuals to gather for lunch or dinner. On January 6, 1934, a group of 15-20 people gathered for a cocktail reception at New York’s Duane Hotel to celebrate Sherlock Holmes’ birthday. (This date also happens to be the birthday of Morley’s younger brother, Felix.) From this modest beginning, the Baker Street Irregulars would become a literary society dedicated to the memory of the great consulting detective. The BSI would hold its first dinner on December 7 of that year and a second dinner on January 6, 1936. The BSI would not gather again until January 30, 1940, at New York’s Murray Hill Hotel, and this is where our mystery begins. A General Motors executive, Edgar W. Smith, had begun a correspondence with Morley several years earlier and volunteered to arrange future BSI Dinners. Morley accepted the offer, and the BSI has its first dinner in four years. The Gasogene-Tantalus read a telegram received from Mr. Vincent Starrett, whose unfortunate absence from the meeting can be compared only with the intolerable absence of Mrs. Hudson from the Baker Street scene. The meeting voted spontaneously to send greetings and a fully autographed copy of the book to Mr. Starrett, an action which, in the preoccupations which ensued, was probably not accomplished. One gentleman who attended the 1940 BSI Dinner was Allan M. Price, Manager of Domestic Sales for the American Bank Note Company. Price had attended the two previous BSI Dinners in 1934 and 1936, and would attend the next one in 1941. Price was also a member of Morley’s Three Hours for Lunch Club, which was a predecessor to the BSI. Price would pass away on February 16, 1943. 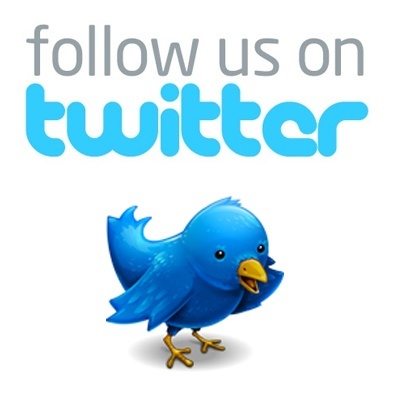 Now, let’s move ahead 73 years — Saturday, January 12, 2013, to be precise. 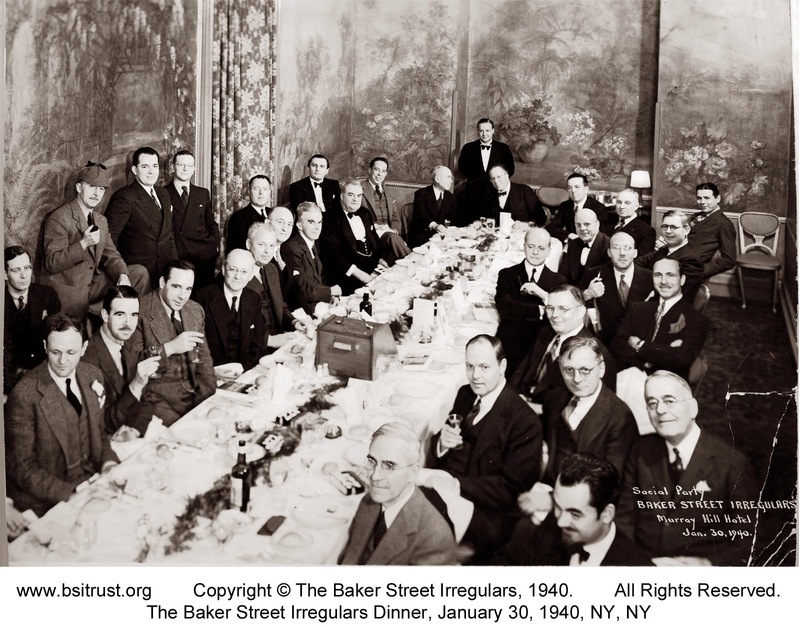 The annual dinner of the Baker Street Irregulars held at the Yale Club in New York City is just one event in what is now referred to as the Sherlock Holmes Weekend, which runs from Wednesday through Sunday. The dinner (now with 160 attendees) is followed by a market on Saturday, at the Roosevelt Hotel, where vendors sell books, collectibles and other items of Sherlockiana to the several hundred who trek to New York for the weekend. One vendor, Javier Doria, a dealer of antiquities from Madrid, had a flurry of activity at his table in the Merchants Room. 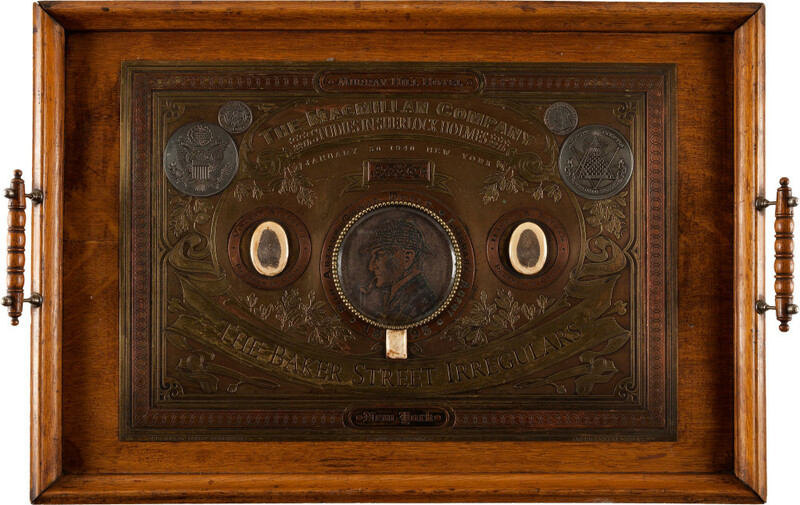 He was offering for sale two brass “plates” with symbolism found on U.S. currency, along with images and emblems of Sherlock Holmes. Both plates were mounted on wooden plaques, one with handles, giving it the appearance of a serving tray. Each references the January 30, 1940, BSI dinner, while the second plate also indicates that it was presented in Toronto on July 11, 1940. The “New York” plate, with handles. Photograph courtesy of Heritage Auctions. 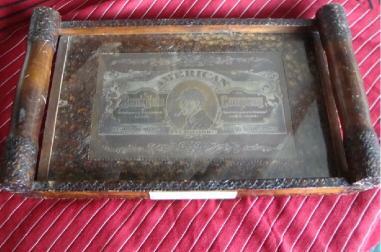 On the back of the tray, is a mounted oval wooden label marked “United States of America,” with an Asian character enclosed in a triangle beneath it. Additionally, three items are pasted to corners: a partial review of Charlie Chan at the Race Track rubber stamped “Avenue de Colmar / Schlumpf / Mulhouse,” a newspaper photo of a recreation of the interior of 221b Baker Street with brief description, and a label with barely legible holographic pencil notations. Some additional text is carved directly into the wood, and a small brass mount is attached. Until that Saturday in January 2013 in the Merchants Room, no one in the Sherlockian world was aware of these plates’ existence. The minutes of the 1940 BSI Dinner make no mention of them. 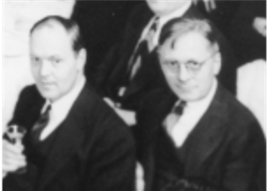 In writings about the BSI history, the 1940 dinner has been described at length (Arthur Conan Doyle’s son, Denis, attended and was somewhat taken aback that his father was considered by the attendees to be the literary agent for Dr. Watson and not the author of the stories), and attendees were interviewed for their recollections. Once again, no mention of these plates appeared in those writings. Both plates, in the bottom right corner, bear the words American Bank Note Company. In addition, the “Toronto” plate specifically mentions Allan M. Price, an ABNCo employee. It would seem logical that he was involved in some way with the manufacture of these two plates. Also, both plates have the words Lambie & Barrowman centered on the bottom. Arthur Conan Doyle was an ardent advocate of Oscar Slater, who was convicted and imprisoned in 1909 for a murder in Scotland the previous year. Helen Lambie was the victim’s maid, and Mary Barrowman was a witness at the crime scene. Both testified against Slater. Slater’s conviction was set aside in 1928 by the Scottish Court of Criminal Appeal. In the bottom left corner of both plates are the words The Broad Street Irregulars. 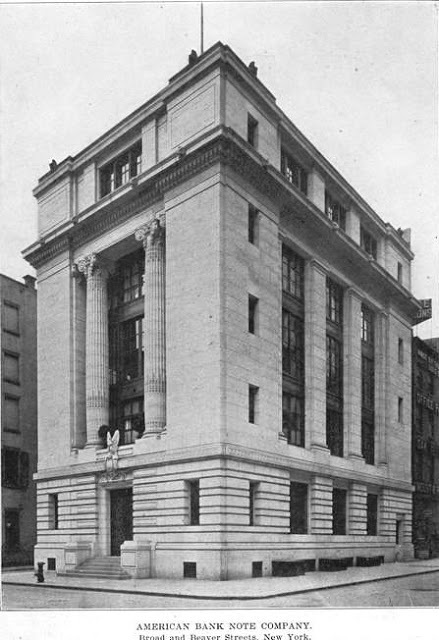 The headquarters of the American Bank Note Company was located at 70 Broad Street in New York. ABNCo occupied the building from its construction in 1908 until vacating the property in 1988. The building is still standing today. Perhaps there were additional fans of Sherlock Holmes at ABNCo in addition to Price? The border on the wooden plaque for the “Toronto” plate matches the border on the brass plate itself. This would seem to indicate that the plate and plaque were both made when it was manufactured. It is this author’s opinion that neither brass plate was manufactured in time for the January dinner. Arrangements for the dinner began as a result of a letter dated December 30, 1939, from Morley to Smith. Smith sent out postcards to invited guests on January 9, a mere three weeks before the dinner. Would this have been enough time for Price to make the necessary arrangements to produce the “New York” plate? The “Toronto” plate includes the menu items from the January dinner. Would these items have been known before that first dinner to guests, or perhaps the plate was made afterward as a commemorative, using the menu card from that dinner? Several weeks had passed since the 2013 Sherlock Holmes Weekend, when another buzz began about the plates. 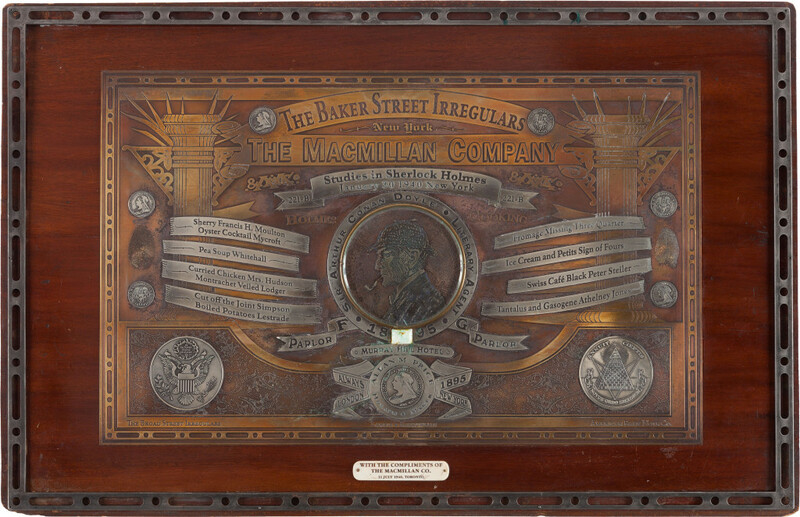 A United Kingdom auction house, Mullock’s, was slated to auction off two Sherlock Holmes plates on May 21, 2013. One plate was familiar to us and the other not. The “Toronto” plate was consigned but did not sell. The “New York” plate was not consigned, and according to some reports, was purchased by someone who had viewed it in New York and acted as an agent for an unknown party. A third plate was consigned, totally different from the first two. This third specimen was not displayed in New York, as its owner sent it to a third party who considered purchasing it but ultimately declined. It makes no mention of the Baker Street Irregulars, the Broad Street Irregulars or the two witnesses in the Oscar Slater trial. Its design is much closer to that of an actual banknote and features some classic ABNCo cherub vignettes. 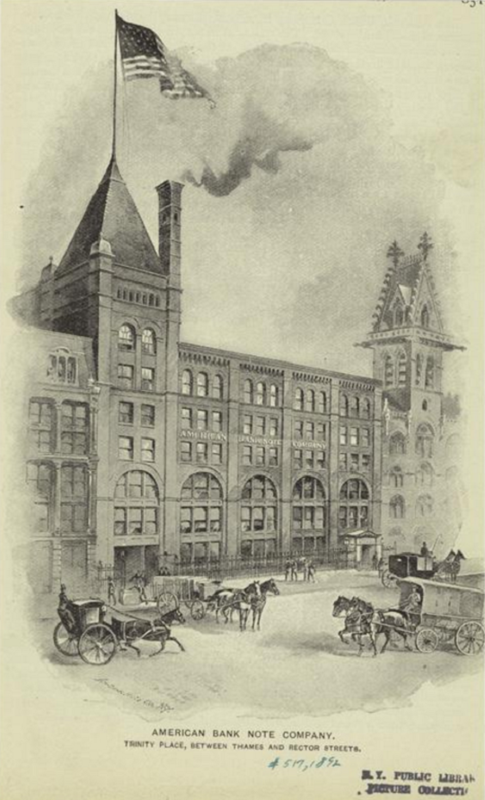 The address of 78 – 86 Trinity Place in New York was the principal address of ABNCo from 1882 until it moved in 1908 to separate headquarters and printing plant facilities. At the time of the BSI Dinners, this address was the New York Curb Exchange (now known as the American Stock Exchange). The references on the rim of ‘BSI Institute of Higher Studies – and Felix kept on walking on Broad St and never a crossword – FVM Wardman Park Hotel 1943’ appeared to be added later. Christopher Morley’s brothers, Felix and Frank, are referenced. All three Morley brothers were born in the Philadelphia area and graduated from nearby Haverford College. Broad Street is a major street in downtown Philadelphia. Frank was the creator of the crossword puzzle that appeared in the Saturday Review of Literature (the original “entrance exam” required for admittance to the initial BSI gathering. Felix Morley was a resident of Washington, DC’s Wardman Park Hotel at times, but not in 1943. This third tray is the most intriguing to the author. With the discovery of all three plates around the same time, it would be natural to assume they were manufactured in close proximity time-wise. With the first two plates referencing events in 1940, why would the third plate have an address for ABNCo that had not been used in over 30 years? Is it possible that the “Bank Note” plate was actually made while ABNCo was located at Trinity Place? If this were the case, that would mean the plate was produced while Conan Doyle was still writing new Sherlock Holmes stories! 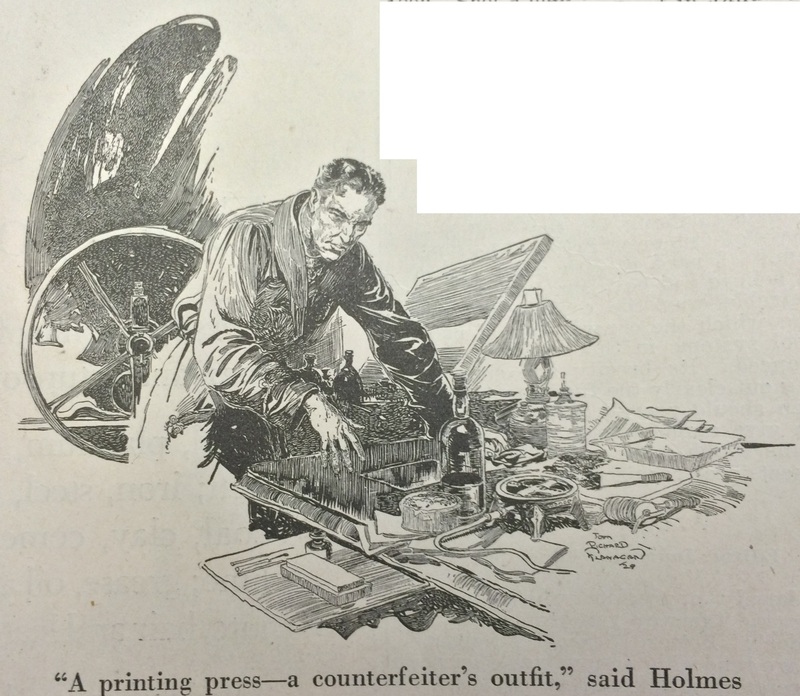 All three plates feature the vignette by Frederic Dorr Steele of William Gillette as Holmes. Gillette started portraying as Holmes on the stage in 1899. Steele illustrated the Holmes stories for Collier’s beginning in 1903, with The Hound of the Baskervilles. Steele would not meet Gillette in person until 1905. 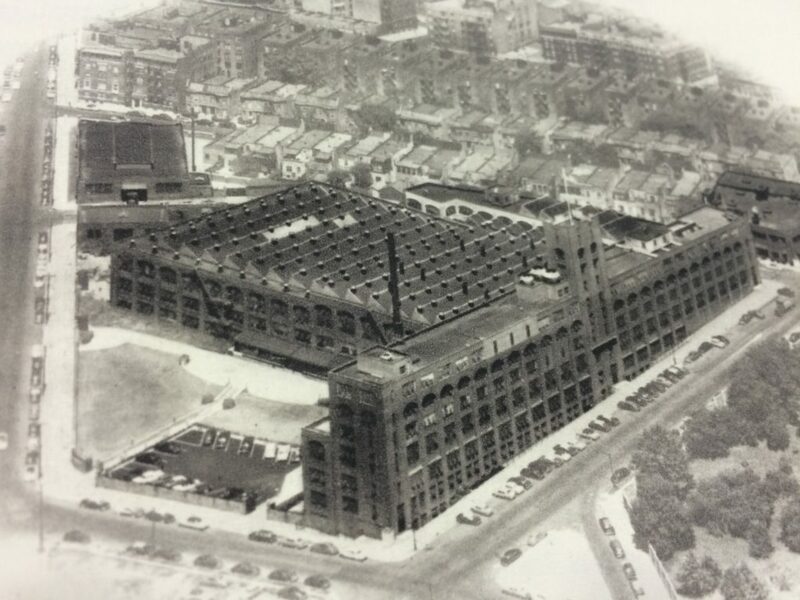 Since the Trinity Place offices were in use until 1908, this does provide a brief window of opportunity for the “Bank Note” plate to be produced there. Unfortunately, it appears that the “Bank Note” plate might have been manufactured in the 1930s. 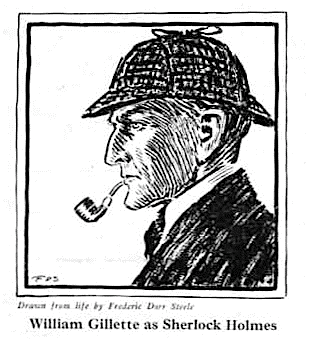 Andrew Malec, a Sherlockian expert on Frederic Dorr Steele’s work, has been unable to find any use of this vignette of Gillette as Holmes until 1929, when Gillette began his farewell to the stage tour. Each plate is currently unique. This would seem to be much effort exerted for a minimal return. Brass was in high demand during World War II. Could additional plates have been made and then later melted for the war effort? Was the “Bank Note” plate made in conjunction with the other two plates, or was it a totally separate project? Both the “New York” and “Toronto” plates were sold on October 8, 2014, by Heritage Auctions. Hammer price was $7,187.50 for each one and included a 25% buyer’s premium. It is believed that both were purchased by the same anonymous bidder. The “Bank Note” plate was sold via private treaty in 2014 and resides within a private collection in the United States. Thanks to Jon Lellenberg for his assistance with this research. If anyone has additional information, or other theories, about these plates, the author would welcome correspondence. 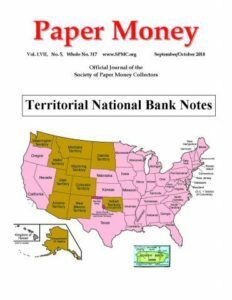 This article was originally published in the September / October 2018 issue (Volume LVII, Number 5, Whole Number 317) of Paper Money, the official journal of the Society of Paper Money Collectors, and is reprinted here with the permission of the author. 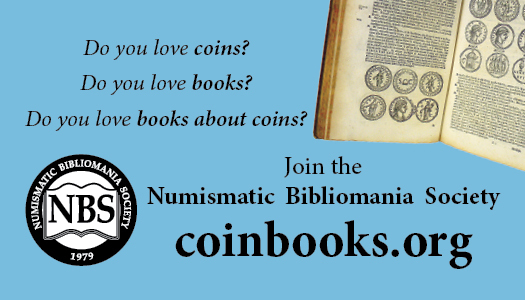 That’s an amazing numismatic connection, and great research. Too bad there remain a lot of unknowns, but I guess that gives scope for someone to do more research!